Metabolomics is the study of metabolites, small biomolecules (carbohydrates, lipids, amino acids and organic acids) present in a biological sample. Metabolomics tools include chromatography for separating metabolites and spectroscopy techniques for their identification. 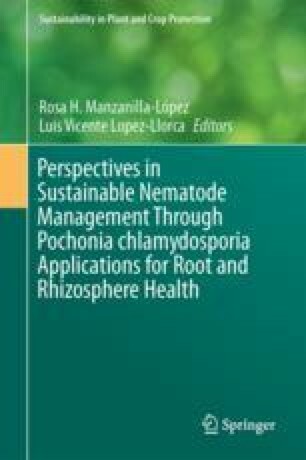 Metabolomics tools have allowed to analyze the composition of tomato root exudates in the tritrophic system: Pochonia chlamydosporia, Meloidogyne javanica and tomato (Solanum lycopersicum) and changes in root exudates that were due to the presence of the fungus, the nematode or both. Large amounts of fluorescent compounds were detected in tomato root exudates from plants with M. javanica root galls and egg masses. Profiles of root exudates in 1H NMR included organic acids, sugars and amino acids. Acetate signal increased in root exudates with M. javanica. Using HPLC-MS metabolomic fingerprints of tomato root exudates were generated. Several m/z signals have been found and related to the presence of M. javanica and only one with the presence of P. chlamydosporia. Metabolomics data integrated with transcriptomics will help to understand rhizosphere signalling in multitrophic systems. This research was funded by the Spanish Ministry of Economy and Competitiveness Grant AGL 2015-66833-R. Luis Vicente Lopez-Llorca was awarded a sabbatical grant (PR2015_00087) by the Spanish Ministry of Education, Culture and Sport. Nordbring-Hertz, B., Jansson, H.B., Tunlid, A. (2006) Nematophagous fungi. eLS Citable reviews in the life sciences doi: 10.1002/9780470015902.a0000374.pub3. Shinonaga, H., Sakai, N., Nozawa, Y., et al. (2009c). 13-Bomomonocillin I: A New WNT-5A expression inhibitor produced by Pochonia chlamydosporia var. chlamydosporia. Heterocycles, 78(11). doi: 10.3987/COM-09-11809. Xu, Y. J., Luo, F., Gao, Q., et al. (2015). Metabolomics reveals insect metabolic responses associated with fungal infection. Analytical and Bioanalytical Chemistry. doi: 10.1007/s00216-015-8648–8.